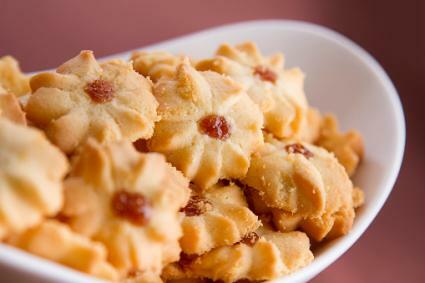 An authentic spritz cookie, also known as a cookie-press cookie or Swedish butter cookie, must be made with butter. No substitutes. Period. The dough needs to be fat enough to press or pipe and yet sturdy enough to hold its shape in the oven. Following the manufacturer's directions, fit the press with the desired disk (wreath, star, flower, tree, etc.). Load the barrel of the cookie press with dough. Do not overfill. Again, following the manufacturer's directions, crank, twist or push the dough through the press until a small amount appears at the disk end. Scrape it off. Holding the press in a vertical position, place the disk end flat against the cold, ungreased cookie sheet so that it makes contact with the pan. Crank, twist or push the lever once, release it and lift the press vertically off the cookie sheet. Repeat with remaining dough, spacing 1 inch apart. Don't mix different shapes on one cookie sheet because they might not bake evenly. At this point, the cookies can be left plain or decorated, if desired, and baked according to the recipe directions. 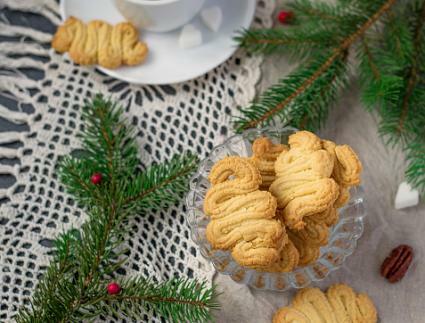 This basic spritz cookie dough is ideal for a cookie press but another treatment is to pipe it into traditional German and Norwegian S and O shapes that date to the 16th century. You can double or triple this recipe with good results. If desired, substitute 1/2 teaspoon almond, lemon, anise or another extract for the 1 teaspoon of vanilla (the other extracts are powerful and 1 teaspoon would be too strong). If you like the look of colored dough, use paste or gel food colors only. Liquid food color will make the dough too wet. And, remember, a little food color goes a long way, so use a toothpick and mix in slowly until the right shade is achieved. Prior to baking, the cookies can be dusted with colored sugar, sprinkles, finely chopped nuts, glacéed fruits and more. Sometimes, plain cookies show off the pretty shape best. 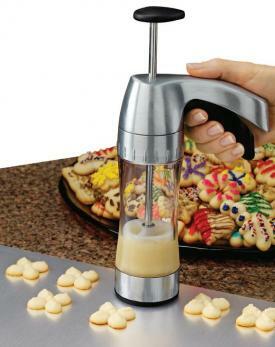 Choose the shape of your cookie by selecting the appropriate disk and assemble the cookie press. If you choose to use a piping bag, attach a coupler and a star tip. In a medium bowl or stand mixer, cream together butter and sugar on medium speed until light and fluffy. Add flour, egg and vanilla or extract of choice. If you plan to color the dough, this is the time to add it. Mix until well incorporated but don't overwork the dough. At this point, the unbaked dough can be refrigerated in an air-tight container for up to four days. When ready to bake, let the dough stand at room temperature for 45 minutes or until softened. Place dough in cookie press or piping bag. Form desired shapes on cold, ungreased cookie sheets and leave plain or decorate with sugar, sprinkles or other garnishes mentioned above. These cookies bake quickly, so watch them carefully. They shouldn't brown, so a 8- to 10-minute bake should do it, depending on the size of your cookies. Remove from the oven and let cool for 5 minutes. Using a thin spatula, immediately remove from the cookie sheet to a wire rack. The cookies also can be decorated after baking by attaching a cherry or nut with a little royal icing or purchased or homemade piping gel, or by dipping them into melted chocolate. When completely cool, store tightly covered in a cool, dry place. They will stay fresh for several days. For longer storage, freeze in plastic containers or air-tight bags. The better option, however, would be to freeze the unbaked dough and let it thaw until softened and then make the cookies. The following variations will work well with the basic spritz cookie recipe. Double or triple that recipe and divide the dough into four to six or more batches of different-flavored cookies with these simple additions or swap-outs. Use brown sugar in place of the white sugar. Replace vanilla with 1 teaspoon coffee extract or add 1 tablespoon instant coffee to the sugar. Replace vanilla with 1/4 teaspoon peppermint extract. After removing cookies from oven, place a mint chocolate kiss in the center of each cookie. Reduce butter to 5 ounces and add 1/2 cup peanut butter. Create a two-tone effect by placing a portion of the basic spritz dough along one side of the cookie press tube and add chocolate spritz dough or colored spritz dough to the other side of the tube. What makes this chocolate variation of the spritz cookie so decadent is that the bottoms are dipped in melted chocolate. A wreath, flower, or star shape with a large surface area would be ideal because they provide a large canvas for that delicious chocolate finish. Pick out a wreath, flower or star shape disk and assemble the cookie press. Heat oven to 350 degrees F. Have several cold cookie sheets at the ready. Cream together until light and fluffy the butter, sugar, and melted and cooled chocolate in a medium bowl or stand mixer on medium speed. Beat in flour, egg and vanilla or extract of choice just until well mixed. Don't overwork the dough or the cookies will be tough. Fill the barrel of the cookie press or piping bag with dough. Form desired shapes on cold, ungreased cookie sheets and leave plain or top with chocolate sprinkles. Sometimes it's hard to tell when a chocolate cookie is done because they start out brown but 8 to 10 minutes in the oven should be enough for most shapes. Let cool on the baking sheet for 5 minutes before removing to a wire rack to cool completely. When the cookies are completely cool, dip the bottoms only into the melted semisweet or white chocolate scraping the cookie against the side of the bowl so the cookie is coated with a thin but thorough layer of chocolate. Place chocolate-side up on cookie sheets until chocolate hardens completely. Serve chocolate side down on a pretty tray. Store tightly covered in a cool, dry place. They will stay fresh for several days. An alternative to adding melted unsweetened chocolate to the dough is to replace 1/4 cup of the flour with 1/4 cup cocoa powder and adding it to the beaten butter. A variation would be to use coffee extract instead of vanilla and dipping the baked and cooled cookies in white chocolate instead of dark chocolate. Almond paste takes the place of part of the butter in this spritz recipe. The flavor of this cookie will have decidedly almond overtones. Parchment paper is used to line the cold cookie sheets because the additional sugar in the almond paste can cause sticking. Use cold baking pans. This is one case where the decoration (glacéed cherries) is added before baking. Heat oven to 325 degrees F. Have two or three cold, parchment-lined cookie sheets at the ready. In a medium bowl or stand mixer, beat together almond paste, confectioners' sugar and 1 egg until smooth. Beat in the butter a tablespoon at a time. Add the remaining egg and cream together until light and fluffy. Add the flour and mix until well combined. Do not overmix. 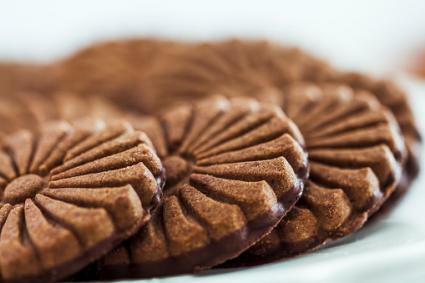 Using a flower-shaped disk, press cookies onto prepared pans, spacing 1 inch apart. Place a cherry in the center of each cookie. Bake about 15 minutes or until lightly browned around the edges. Cool on the pans. Remove to a wire rack. Store tightly covered. Instead of cherries, a variation would be to place a marcona almond in the center and then the dust the entire cookie with coarse sugar before baking. Another variation would be to substitute green glacéed cherries or another piece of dried fruit (bits of dried peaches or apricots are perfect with almond) in the center before baking and then drizzle the baked and cooled cookie with flat icing. Part of the butter fat in this spritz cookie recipe is replaced with full-fat cream cheese for a tangy finish. In a medium bowl or stand mixer, cream together butter, cream cheese and sugar until light and fluffy. Beat in egg yolk, and extract of choice. In a separate small bowl, whisk together flour and salt. Add flour mixture in three stages to the creamed mixture, mixing well after each addition. Load the dough into a cookie press with the disk shape of your choice. Bake for 8 to 10 minutes or until lightly golden. Let cool on the pan for 5 minutes before transferring to a wire rack to cool completely. 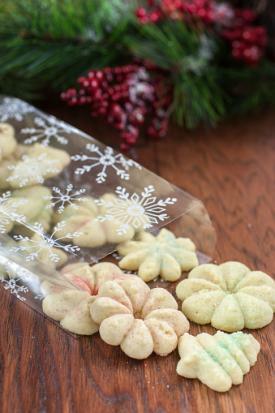 These cookies are traditionally left undecorated. A variation of this cookie would be to tint the dough with paste or gel food colors and sprinkle with a corresponding or contrasting fine or coarse sugar before baking. Use cold, ungreased cookie sheets. Don't use a hot cookie sheet for subsequent batches because the heat will cause the butter in the dough to ooze out and warp the shape of the cookies. Wipe the cookie sheets down after each use. A grease-free cookie sheet also ensures that cookie shapes will adhere to the pans when pressing out shapes. The dough must be kept cold enough so the shapes will have definition, but not so cold they are impossible to press out. Make a test bake with one or two presses of the cookie cylinder. If the dough is too soft, chill it for about 15 minutes and try again. If the cookie dough is too dry, it won't flow through the cookie press. Add 1 or 2 teaspoons of milk or cream and mix it into the dough. Refrigerate a few minutes before trying again. If at any time the dough becomes too soft, refrigerate for about 5 minutes before reloading the cookie press. The dough for basic spritz cookies is an easy one, consisting of only five ingredients and the variations are endless. There are a few simple rules to keep in mind for success -- real butter, cold ungreased pans, dough that is neither too cold nor too warm and watching the baking time carefully. A little practice with a cookie press or piping bag and you will be making spritz cookies with ease.